The Al-Qaeda flag has been flying high over Libya and the governments of the western world that helped remove Gaddafi from power don’t seem to mind at all. The flag, which contains the phrase “there is no God but Allah” with a full moon underneath, has been photographed flying beside the new national flag of Libya at the courthouse in Benghazi. The courthouse in Benghazi is where the “rebels” established their provisional government, and it is where the “media center” for communication with foreign journalists was located during the fight against Gaddafi. 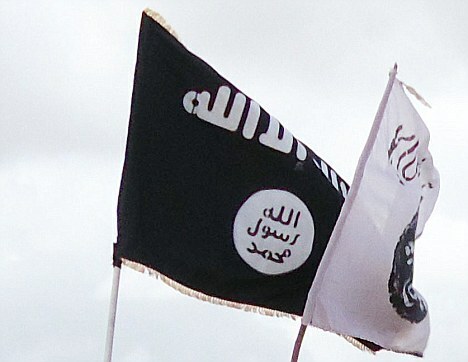 So it isn’t as if the al-Qaeda flag has been flying over some insignificant building. But this should be no surprise. It has been known all along that al-Qaeda was very heavily represented in the army of “the rebels” and among the leadership of “the rebels”. Now, thanks to Obama, they have taken over Libya and they intend to impose a brutal form of Sharia law on the entire Libyan population. You can see more pictures of the al-Qaeda flag flying over Libya on the website of the Telegraph and on the website of the Daily Mail. The following is video of the al-Qaeda flag flying over the courthouse in Benghazi…. So where is the uproar about this in the U.S. media? I guess it would be hard to explain to the American people why they should be sacrificing their sons and daughters to fight al-Qaeda when we just spent billions of dollars helping them take over Libya. Sadly, the flag of al-Qaeda is not just being flown at the Benghazi courthouse. According to eyewitnesses, it is now being displayed all over Benghazi. The following is an account from an eyewitness that has seen the flag flying over the Benghazi courthouse for himself…. But according to multiple eyewitnesses—myself included—one can now see both the Libyan rebel flag and the flag of al Qaeda fluttering atop Benghazi’s courthouse. According to one Benghazi resident, Islamists driving brand-new SUVs and waving the black al Qaeda flag drive the city’s streets at night shouting, “Islamiya, Islamiya! No East, nor West,” a reference to previous worries that the country would be bifurcated between Gaddafi opponents in the east and the pro-Gaddafi elements in the west. So what in the world are we supposed to think about all this? We were told that we had to invade Afghanistan because they were harboring “al-Qaeda” leaders. We were told that it was necessary for us to stay in Iraq for so long so that “al-Qaeda” would not take over. But now we have helped al-Qaeda take over Libya. It isn’t as if the governments of the western world did not know what was going on in Libya. According to the Telegraph, the leader of the Libyan rebels was very open about the fact that his “troops” included significant numbers of al-Qaeda fighters that were firing bullets at U.S. soldiers in Iraq…. According to a recent article by Kurt Nimmo for Infowars.com, al-Qaeda rebels had established an “Islamic emirate” in eastern Libya as early as February…. In February, it was reported that al-Qaeda had set-up an Islamic emirate in Derna, in eastern Libya, headed by a former prisoner at Guantanamo Bay, Abdelkarim al-Hasadi. Now that they have won the war, the “rebels” have announced that they will be imposing strict Sharia law all over Libya. The head of the National Transitional Council in Libya, Moustafa Abdeljalil, has already made this very clear. Just consider the following statements…. Shouldn’t the people of Libya have a say in all of this? Sadly, one kind of tyranny has just been replaced with another. In fact, some elements of Sharia law have already been implemented. According to a recent article posted on the Telegraph, Mustafa Abdul-Jalil has already announced that the law banning polygamy has been repealed because it is not compliant with Sharia law…. The American people were told that the system of government established by the Taliban in Afghanistan was so repressive that it needed to be overthrown, but now we are helping essentially the exact same system of government be set up in Libya. Not only that, we have greatly destabilized the region and there will almost certainly be very bloody internal conflicts within Libya for many years to come. The following comes from a recent report posted by The New American…. Gadhafi and the remnants of his regime are thought to have distributed vast stockpiles of weapons and wealth so anti-revolutionary forces could wage what the despot promised would be a long-lasting insurgency. Many of those fighters fled to the desert and are staging surprise attacks on roaming bands of militiamen. The ongoing battles have sparked widespread speculation that the bloody conflicts will continue to rage far into the future. In addition, as The New American notes, as a result of this conflict huge amounts of very dangerous weapons have fallen into the hands of potential terrorists…. Advanced weaponry including anti-aircraft missiles has also fallen into the hands of known terrorist organizations. The deadly stockpiles are turning up all over the region, but it remains unclear how much firepower has been smuggled out of the country so far. But does the Obama administration seem alarmed by any of this? No, they just want us all to praise them for a “job well done” in Libya. Hopefully the American people will see right through this nonsense. The flag of al-Qaeda has been flying over the headquarters of the provisional government in Libya, and yet the American people are the ones that are being treated as potential terrorists. Our borders are wide open and anyone that wants to can sneak into this country, and yet we are told that we must have our private parts examined before we are allowed to get on to an airplane. Something is very, very wrong. Somehow the focus of national security has gone from protecting the American people to spying on the American people. As I wrote about yesterday, the government has become absolutely obsessed with watching us, listening to us, tracking us, recording us, compiling information on all of us and getting us all to spy on one another. Meanwhile, the U.S. government has been spending billions of dollars to help al-Qaeda take power in Libya and is helping them enslave the entire Libyan population to a brutal form of Sharia law. Can anyone explain how this makes any sense at all?